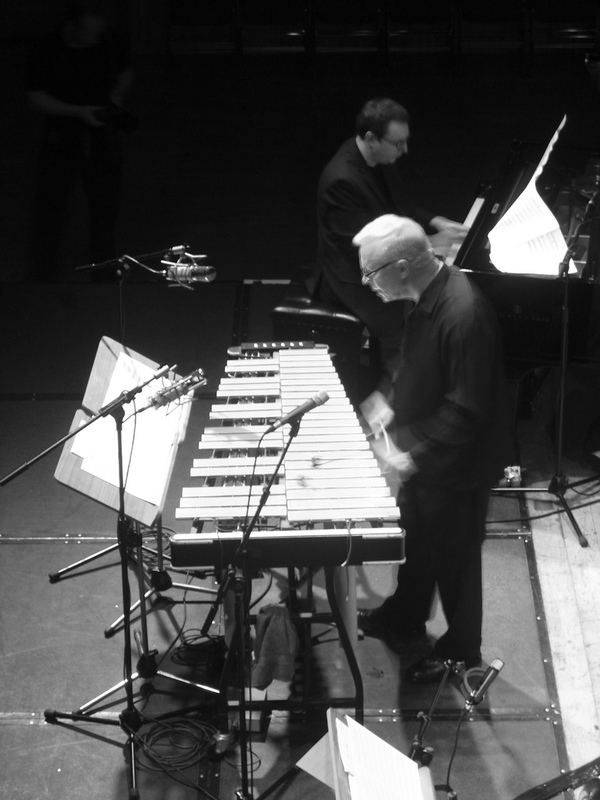 Following a warm up week in New York, tonight’s concert was the first major outing for Gary Burton’s new quartet, and compelling stuff it was too, hitting the pocket from the off. As early as the second tune, ‘Last Snow’, the band already has us with some deep sensitive playing off the back of its gorgeous melody. Guitarist Julian Lage immediately impressed, seducing us with luscious arpeggio sweeps, before showing us his chromatic bop mettle on drummer Antonio Sanchez’s angular blues, ‘Did You Get It’. Sanchez made the most of his own piece, the odd number bar lengths handled with a sure-footed confidence further exhibited on a late era Monk tune, ‘Light Blue’. Lage’s playing throughout was something to behold, especially on a jaw dropping extended solo intro to ‘My Funny Valentine’, his speedy semi-quaver precision only ever being at the service of a soulful sensitivity that was a sheer delight to bask in. Double bass player Scott Colley took his moment in this track, laying down some thoughtful lines sculpted with a fine lyrical grace. Mr Burton wasn’t to be overshadowed though. His improvising was so effortless and relaxed, even at the high tempos, that at times we were overwhelmed with the musical treats. I wanted to press pause so I could soak it all up better. After the break, Burton joined the Scottish National Jazz Orchestra led by ex-Burton band tenor player, Tommy Smith. This was less successful than the first set, the energy level in the hall having dipped somewhat and the Orchestra seeming a little tired after their four gig stint at the festival. Nevertheless, there was enjoyable stuff here, notably on the Wayne Shorter classic, ‘Speak No Evil’, and ‘Virgo Rising’, when the orchestra were definitely grooving. Burton’s best stuff came through on the ballad ‘Infant Eyes’, and Smith got nice and Coltraney on an enriched arrangement of ‘Footprints’. Lots of good stuff here, but the guitars have it. There was promise here for sure. The combination of Fernando Corona aka Murcof’s minimalist electronica grace and the idiosynkrasia of 'not'-pianist Francesco Tristano ought to have delivered something special, but I’m not sure it did. Things started promisingly enough with Tristano scattering some deeply reverberated quizzical piano notes. Murcof then faded in a deep bass thrum overlaid with a thin shade of white noise. And, … well that’s where it stayed for quite some time. Tristano’s harmonic pepperings were more or less of the same ilk throughout. He did start to work on the piano’s acoustic textural potential, leaning in to mute pluck and scratch the strings inside the piano body creating those familiar avant-classical shimmerings. He then slapped, tapped and banged the frame, inducing various rhythmic effects, all swathed in just a little too much digital reverb. It was interesting stuff, but it needed to go somewhere somehow. Murcof set up an even low rhythm thud on the second piece, the accompanying retro analog sounding arpeggios really reminding me of Phaedra era Tangerine Dream. Again, there was something really quite good about it, but it seemed to need more. The volume increase and aural thickness left Tristano’s continued piano body rhythm attacks somewhat outgunned, though he did later respond with some high velocity sweeps across the full range of keys that managed to cut through and make some impact. The final piece had something approaching a groove, the lithe and partially effete Tristano swaying accordingly to the low beat emanating from Murcof’s laptop. Good this, but once again, it overstayed it’s welcome. A not insignificant number of the audience had already voted with their feet at this point, and the notably short set was not extended with an encore. Not good value I suppose, but I’m not sure too many were complaining. Hurray! I finally managed to get to see John Scofield last week. Through some bad luck with timings and being based in Manchester, somehow it’s taken me this long. Technically I did see him many years ago at the Jazz Café, but illness on my part meant an early exit after a few tracks. Although I’ve got time for most styles of jazz guitar, Scofield’s slurry bluesy playing is pretty much bang on for me (and I guess what I try to go for in my own playing). There were no disappointments either, as Scofield was on funky fine form. The scratchy groove of ‘Chicken Dog’ was bloody great, drummer Bill Stewart’s fluid laidback feel nudging up against the lightly overdriven double stop bends that are Scofield’s trade mark. It wasn’t all bump and grind though. The trio delivered a sweet and sensitive take on ‘These Foolish Things’, Steve Swallow playing a most heart rendering bass solo up in the high upper register of his five string. Most of the tracks were of the bluesy groove variety with a little country twang thrown in for good measure. Scofield’s distinctive use of raw altered and chromatic harmony wasn’t neglected however, being in evidence aplenty on the dirty grit of ‘The Low Road’, it’s tough density enhanced by the use of delay sampled guitar self-accompaniment. Scofield joined the Scottish National Jazz Band after the break for a set of big band arrangements led by tenor player, Tommy Smith. A highlight was ‘Groove Elation’, the big band managing to get the energy across well, with Scofield’s improvising punching through nicely. On a similar note, Miles Davis’ ‘Splatch was a good one too. The big band set wasn’t an unqualified success, the sound mix being messy at times, and the horn mix balance wasn’t quite right. Even so, it worked well in the main, with Scofield’s groove slotting in really well, and perhaps better than one might have expected within the formality of large arrangements. Top marks London Jazz Festival programming for making me a very happy bunny tonight. I’d heard lots of good things about pianist Zoe Rahman in recent years, so I was really pleased to see she was opening this double bill playing solo. The plaudits are justified, as she was great. Her playing is strident and strong, with heaps of dynamic and harmonic variety. There was plenty of tasty swing bluesy phrasing in there, but also lots of ethnic piquancy that really adds to sound palette. 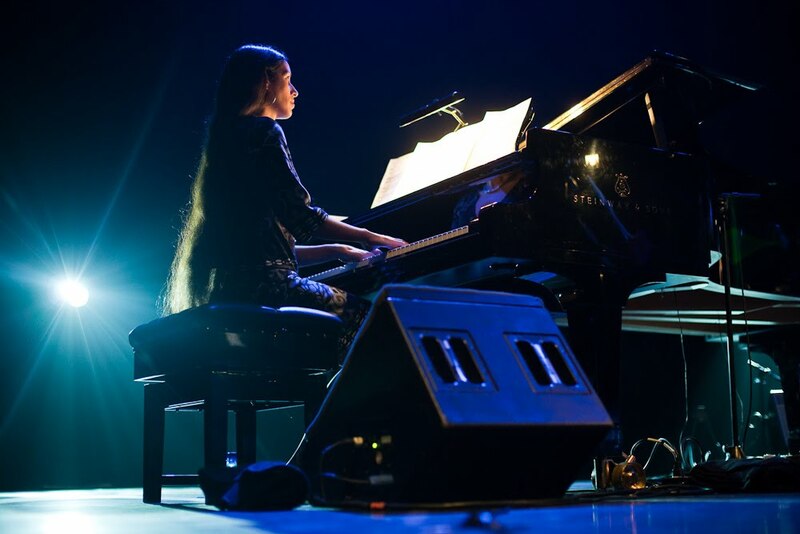 She really worked the timbral and textural potential of the piano into her playing too, making for an engaging solo set that many couldn’t match without accompaniment. 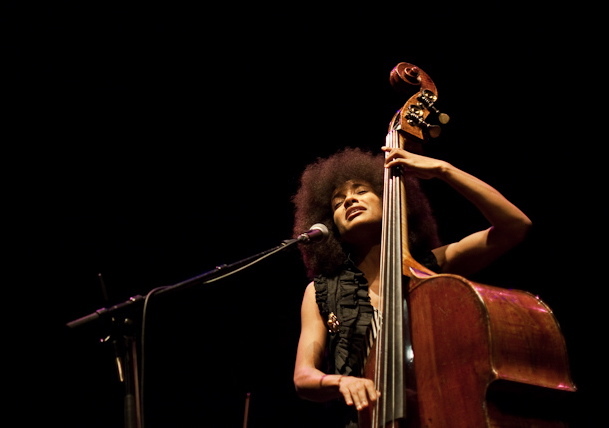 Terms such as ‘prodigy’, ‘natural’, ‘gifted’ and so on get bandied around all too easily (sometimes by myself), but the amazing Esperanza Spalding has a fair right to those labels. At the concert she mesmorised the entire Queen Elizabeth Hall with ease from the start. She frequently sings either solo or accompanied just by her own double bass, and on these occasions you could hear a pin drop over the quiet hum of the hall’s sound system, it’s mains noise filters not usually exposed to such scrutiny by an audience listening so intently. What makes this even more remarkable is that much of her material is complex and quite difficult listening. Her melodies are constantly surprising, going off in all sorts of directions, and rarely follow conventional resolutions. Although they’re very different artists, it’s the same ability Polar Bear have to make what might be heavy listening very accessible. A case in point would be the track ‘Knowledge of Good and Evil’, where Spalding sang a melody that dipped and weaved over a fairly hard to grasp chord sequence, but she made it work wonderfully. Same with the restless ‘Chacarera’. The technical ability required to deliver the tricky lines is demanding enough, but the way she manages to breath life and soul into them is stunning. A minor but not insignificant downside was that Spalding’s star quality appeared to inhibit the band somewhat. Leonardo Genovese on piano and Richard Barshay on drums were perfectly acceptable, but never really sparkled. Similarly, the string trio of Olivia de Prato (violin), Lois Martin (viola) and Jody Redhage (cello) got the job done perfectly well, but didn’t catch one’s ear. Guest star Gretchen Parlato was closest to giving Spalding a run for her money when she joined for a delightful vocal duet on Jobim’s ‘Inútil Paisagem’. I’m not usually inclined to use the word, but this performance was awesome in the true sense. Spalding returns for concert at the Barbican in April next year that would be worth checking out. Zoe Rahman and Esperanza Spalding photos copyright © 2010 Emile Holba. Well this was new and strange – improvised jazz with improvised movement, Gwilym Simcock on the piano with maverick Nigel Charnock on 'movement'. Initially the whole thing seemed somewhat absurd. Simcock started with some very quiet and reflective playing that Charnock soon started contorting to. The thud of his feet on the stage was really quite loud relative to the quiet piano, and after having adjusted to the absurdity, I then became frustrated at this audible intrusion. After a short while though, it all started to make sense and became quite good fun. After the first piece Charnock explained his hyperactivity, admitting that he’d been dreading the performance, and it’s true that the intensity did seem a strange partner to Simcock’s contemplative opening gambit. Charnock began to calm down, partly through exhaustion I suspect, and the improvisatory interplay between the two started to gel and make more sense. Simcock did a good job of trying to match Charnock’s movement with a few rhythmic punches, but there were quite a few misfires. It was hard not be won over by Charnock’s natural wit and playful vulgarity, and he raised quite a few laughs, especially on his several trips out into the audience, at one point climbing some ladders at the back of the room and banging on the sound booth. In the second half Simcock was joined by his regular trio partners Yuri Goloubev on double bass and James Maddren on drums for some tracks from the ‘Blues Vignette’ record. Maddren is just getting better and better, managing to combine a very fluid underlying pulse with an understated busyness that matches Simcock’s harmonic density deftly. Goloubev seemed a bit bemused, having missed the rehearsal due to flight delays, and wasn’t at his most fiery, but still did the job. He seemed a little wary when Charnock reappeared to join the trio for a few tracks, but stoically got on with it. This evening was a fun proposition and came off well as a one-off, but I did find the movement distracted much attention from the music, ultimately the music being a poor loser. Also, much of the success of the event came from Charnock’s witty asides. In some ways we were won as much by the comedy as the movement, which did get repetitive, Charnock appearing to struggle for ideas from about half way through. A good time was had by many nonetheless. Courtesy of Mr Walker himself, I've just found out that the Gwilym Simcock, Mike Walker, Steve Swallow & Adam Nussbaum quartet have the new moniker of 'The Impossible Gentlemen'. There's a new album and tour to look forward to 2011 too. A tad more info on Gwilym's website. Their sellout concert at the RNCM was reviewed on the Modulator below. A lovely evening was had at the RNCM last week for the Kenny Wheeler 80th Birthday concert. It's been a while since I've seen Wheeler, back in the days when I was living in London. I managed to catch him quite a few times at the Vortex, then on Stoke Newington Church St, and I really remember shuffling past him practising on the stairs. Wheeler's lost none of his modest charm, opening the set in quartet formation, himself of course on flugelhorn, Manchester ex-pat John Taylor on piano, Chris Laurence on double bass and Martin France on drums. A tentative and vulnerably beautiful 'Kind Folk' was followed by a steadier 'Everybody's Song But My Own'. The UK stalwarts continued to appear, with sax players Stan Sulzman, Julian Arguelles joining next, then with Evan Parker for a top sounding short free improv banter with drummer France. Vocalist Diana Torto entered with the rest of the big band for a great set of characteristically fulsome Wheeler arrangements conducted by Pete Churchill. Wheeler's compositional skills are in fine form, the band treating us to a series of gorgeous new pieces. 'Canta No.6' was a highlight, with some great gusto improvising from Torto and a touching autumnal solo interlude from Taylor, who was on sparkling form tonight. Catching Taylor was an extra treat for me, as I've been wanting to see him play for some time, having heard many versions of his UK standard, 'Ambleside Days' (and having put in a good few hours on it myself). 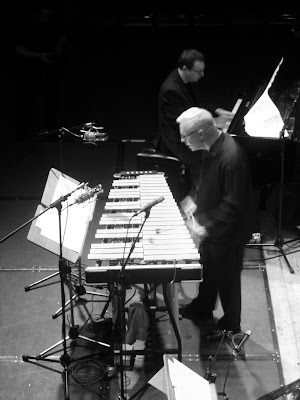 On the whole the solo improvisations were quite short and to the point, the musical centrepiece of the concert being Wheeler's warm and rich arrangements. I was really impressed with Torto who made the most of her opportunities to shine. A heart warming evening, and a great lead in to John Taylor's gig with Torto and the RNCM Big Band.